We learn to dress ourselves around, what, kindergarten? It's not hard. You put garments on the parts that you don't want to get cold and that's it. Back then we didn't give much thought to how we looked in our clothes — or maybe it's that we didn't give much thought to what other people thought. But somewhere along the way choosing clothing became a despair-inducing exercise. How does this look? What does it say about me? Is it in style? It is too young or too old for me? Does it fit? 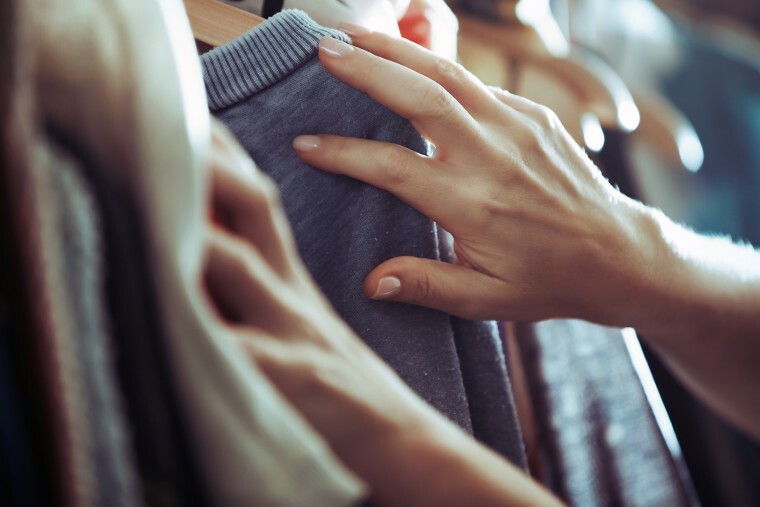 Some of us may respond by overbuying, stuffing our closets with things that don't quite work; others by giving up and wearing the same things on repeat. Either way, getting dressed ends up a miserable affair. That's where I found myself, five years after trading a conventional go-to-the-office job for the freelance, work-from-home life. With great relish, I had donated my “work clothes.” But with no dress code, and nowhere to really go every day, I couldn't justify the expense of buying clothes. Besides I'd never liked shopping anyway. But guess what: even writers leave the house sometimes. And when I needed to appear in something other than my bedraggled wardrobe, I'd frantically scour a clothing store and buy whatever met some vague interior algorithm of affordable and not awful. Except sometimes it turned out to be awful. Meanwhile I held on to the remnants of my old wardrobe and ultimately built a chaotic mess that made my blood pressure spike every time I stepped foot inside my closet. I'd wear the same thing two or three days in a row just to avoid making decisions. A daydream began to loop through my head: what if I just throw it all out and start from scratch? How freeing would that be!? But I didn't have the nerve, know where to even start, or want to spend that kind of money. Finally one day it clicked. I'm a big believer in hiring people who are more knowledgeable than I am to do things I'm not well-equipped to do — I hire a professional to prepare my taxes every year, for instance. I'll also spend money to save time. There are people in this world who know how to pick out clothes that best suit a person. Why not turn to an expert to dress me? Once I let go of the idea that I should be capable of this task and embraced handing a loathsome responsibility over to a pro, I got really excited. Especially when I came across an article about stylist Laurel Kinney. She had studied psychology and came from a social work background. This comes in handy, she tells NBC News BETTER. Convinced even before the free consultation, I signed on to a Style Shift workshop. This remote (Kinney lives in Austin) several-week program packed with video chats, strategizing and shopping support would take me from a shopping-phobic, rattily-dressed slouch to — hopefully! — a savvy, confident, dresser. Spoiler alert: It totally did — but not without some growing pains. Week one brought lots of homework. Rather than plunging into shopping, or even purging my closet, I first needed to step back and think about my style challenges, what my style says about me (and what I want it to say), and then some deeper reflection: Where am I in life? What are my values? When have I felt my best and when did I last feel amazing in my clothes? The questionnaire called for brutal honesty, assessing things like, “what do you think people think when they look at you?” (You mean in my ill-fitting jeans, stained hoodie, tattered shoes and grubby dog-walking coat? I don't even want to know!) The anonymity of answering the thought-provoking question by email made it easier. It felt more like unloading on a therapist than talking with a stylist. In between the heavy stuff was something more fun — Pinterest time! I created a board just for the two of us where I pinned everything that spoke to me. Without stopping to second-guess if a piece of clothing was “me,” without ruling things out because of cost, I just pinned my little heart out. Going back to scroll through it, it was easy to see patterns appear. I like stripes. A lot. And a vintage flair. A kernel of what I want my style to say began to materialize. Next up was a deep dive into my closet to identify the pieces I wear the most and those I love the most, and what each evokes in me and says about me. Looking at so many ill-advised choices, and items I'd wear for lack of anything better, was discouraging. I had to remind myself this was the slog before the good part. I also wasn't alone. Step 3: Bring me a glass of wine? Although I'd have said there was almost nothing in my wardrobe I loved, it was surprisingly difficult to discard things. This is where it became clear how emotionally attached we can become to our clothes. What I needed to remember, my mentor reminded me, is it's not about the article of clothing. As much as I treasure the memory of buying those jeans at the thrift shop in Paris and wearing them on that wonderful trip, I don't have to keep the jeans – which are uncomfortable and don't fit well — to keep the memory. And yes, that powerlifting hoodie speaks to who I was at a transformational time of my life. But the oversized hoodie is not a talisman; I don't need it to remind me of the accomplishments that meant so much to me. As a deeply nostalgic person this was the hardest part of this process. The process was emotionally draining and far more intense than I'd have expected. By now I was feeling a little down on myself. The small dressing room that's home to my closet was also in mayhem, and living in a mess takes a toll as well. I was ready for the fun part, stat. At last, fun! After talking through the “gaps” in my closet – basically I needed all the things – and her thoughtful processing of my self-reflection and inspirations, Kinney shopped for me. On a Friday afternoon she sent a link to my digital look book, my new virtual closet, and I literally couldn't put my laptop away the rest of the night. While a few picks raised my eyebrows (I don't think I'll ever wear a romper) others were uncannily me. I'd mentioned a beloved jacket I'd lost and without seeing a photo she picked a jacket so similar in spirit I could have wept. A pair of boots reminded of me of some my dad had when I was a kid and were perfect. And a green, vintage-influenced dress from British designer Boden was everything, I texted her gleefully. I stayed up long past my usual bedtime shopping from her selections. UPS deliveries were better than Christmas as new clothes started rolling in. I texted delighted mirror selfies to Kinney sporting my new garb. “You look like YOU,” she replied to one. And I even ventured into brick and mortar stores with her as my remote shopping partner. A pair of super snug black suede jeans I wouldn't have considered before? I texted a dressing room selfie; “hell yes!” she fired back. Suddenly the old clothes I was still hanging onto became much easier to part with. The process motivated me to make the closet and dressing room an enjoyable space, so along the way I had them both painted. When I finally hung my new – plus newly appreciated old — clothes back up, I was giddy. With plenty of breathing room between the downsized wardrobe items, the closet — a standard issue, just-barely walk-in — felt like a boutique. I couldn't wait to get up every morning and choose what to wear. And Kinney was there to support that, too. I added photos of the pieces I'd kept to the look book, and as I write she's putting together outfits for me in the virtual closet. At the beginning I wished I could have done this in person, just let her take over the job of picking my clothes. But I'm so glad we did it this way. While I have to go back to my accountant every year because I'm not going to learn how to prepare my own taxes, now I am equipped to style myself. I've realized it's ok to invest (that's her word) in clothing that helps me feel like and express myself — my true self. I can shop and choose pieces that will fit and flatter, and discard those that don't without blaming my body. My only regret is not doing this years ago.